Distinguishing Characteristics Caucasian female. Graying brown hair, green eyes. Clark has previously fractured her pelvis and her lower left leg. She has scars on her forehead and across the bridge of her nose, and a Caesarean section scar on her abdomen. Clark was last seen by her ex-husband in Little Rock, Arkansas on March 4, 1987. Although they were divorced, they still lived together. Her ex-husband stated he saw her getting into a taxi. She was en route to Fayetteville, Arkansas but never arrived there, and there is no record of her cabfare. She has never been heard from again. Clark enjoyed traveling in 1987 and would make visits, sometimes unannounced, to Memphis, Tennessee; Hot Springs, Texas; Oklahoma; and elsewhere in Arkansas. 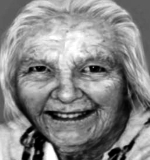 Authorities have found no indication of foul play in her disappearance, but her son believes her disappearance is suspicious because she never picked up the Social Security checks that were her only source of income. According to Clark's son, she was the victim of domestic violence for much of her life. She was declared legally dead five years after she was last seen. Her case remains unsolved. Updated 5 times since October 12, 2004. Last updated March 21, 2019; age-progression updated.